I mentioned elsewhere that I'm currently testing a Nikon 10X NA 0.25 160/- objective that is new manufacture and sold as an in-stock item by Edmund Optics HERE. It's listed for $95 USD as of today. The bottom line is that this objective is very good. It's not as excellent as the Nikon CF N Plan Achromat 10X NA 0.30, but I was surprised at how good it is. At this point I have no reservations recommending this objective as an off-the shelf "known quantity" for people who want to get started with high mag stacking using a microscope objective on bellows. 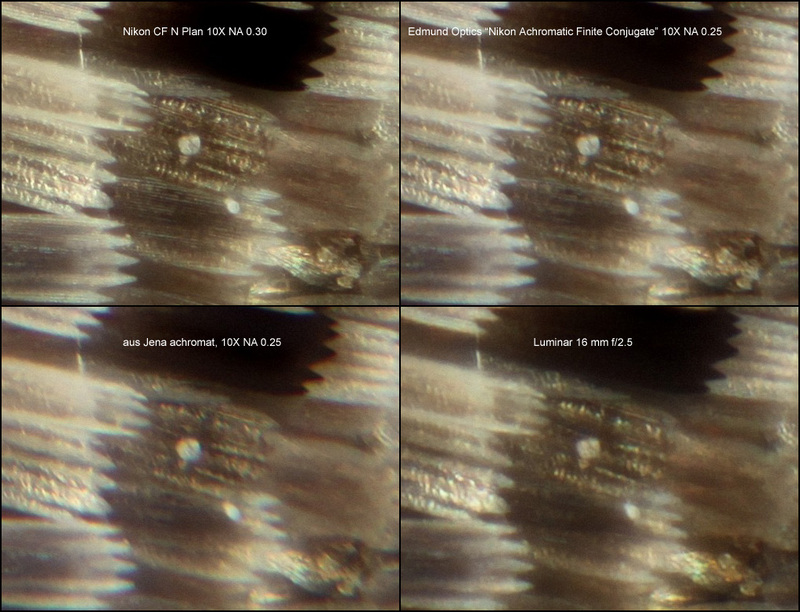 The results shown here are from a Canon T1i camera, 4752x3168 pixels (15.5 million) on a 22.3 x 14.9 mm sensor, 41 frames of the camera's highest quality JPEGs, focus-stepped at 5 microns, stacked by Zerene Stacker PMax. No post-processing except to lay up the images for presentation here. 3. an old aus Jena 10X NA 0.25 160/- achromat that I used to be pretty happy with. 4. Luminar 16 mm f/2.5, used wide open. Here is a full frame image from the new lens, showing where the crops will come from. I'll call these "center", "middle", and "corner". One might quibble that "middle" is pretty close to the corner. I chose it because this is roughly the area where the new objective starts to lose sharpness. Full frame original PMax output from the Edmund Nikon lens can be found HERE. 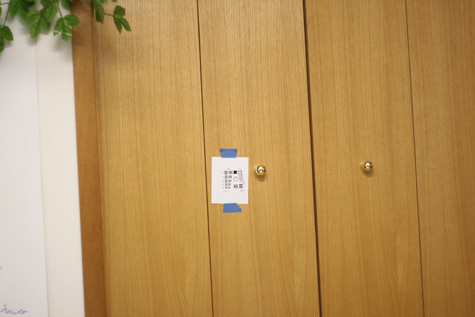 I was not surprised that the new lens performed well at image center. Any decent achromat should do that. What did surprise me is that aside from a bit of CA (probably correctable in post-processing), this new objective was better than the Luminar 16mm f/2.5 clear out to the corners of an APS-C sensor. Edit Apr 16, 2010: evaluation upgraded from "pretty good" to "very good" to reflect later tests. Edit Feb 2, 2013: added full size image. Edit 11/26/2017 updated URL at Edmund Optics for the objective. Nice to know these achromats perform well! Perhaps this is something you were about to address in a later post but I go ahead and ask anyway: The finite CF Plan 10X objectives appear to perform quite well at magnifications/extensions in a range well outside their theoretical optimum. This is a very nice feature if you intend to use it with a bellows setup. Have you noticed any significant difference in this respect with the "Conjugate"? Does, for instance, the edge softness creep into the frame as you shorten the extension? If the "Conjugate" simply has a smaller "excellent" image circle and this stays the same over a range of magnifications you would assume that to be the case (this would also suggest that the edge performance could be better at higher magnifications). I suspect it's not as simple as that? I suspect it's not as simple as that? 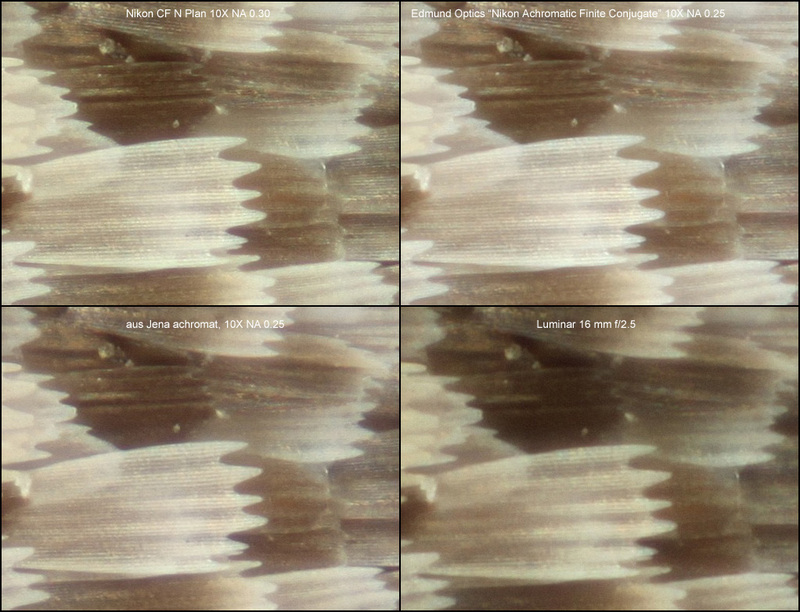 The tests shown above are at 156 mm extension, slightly longer than the nominally correct 150 mm. I chose that particular extension because it was the closest to nominal that I could conveniently get, using a bellows-above-turret setup that I wanted to use. 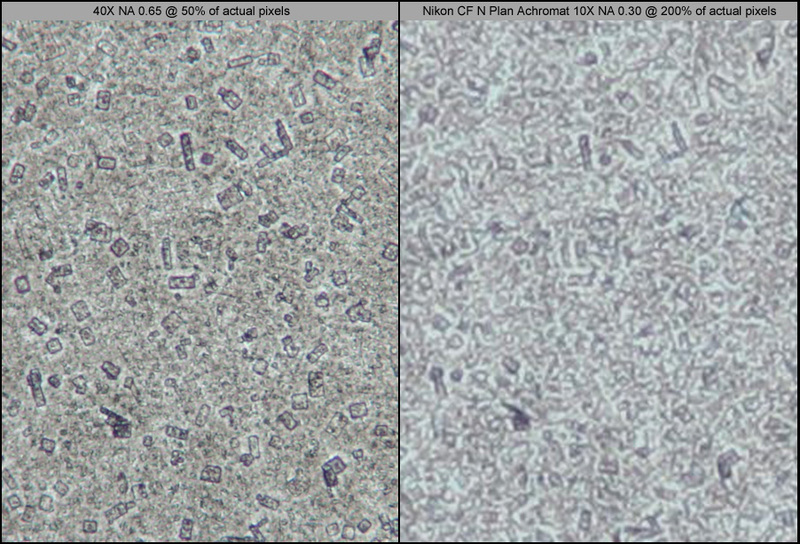 I just now ran a quick visual check at much longer and shorter extensions (~300 mm and ~100 mm, sensor to mounting threads), comparing the new Nikon Achromat against my old Nikon CF N Plan Achromat 10X NA 0.30. "Visual" means that I'm driving an HD video monitor over the camera's HDMI port, and I'm using the camera's zoom so I can see actual pixels. I trust the results. At longer extension, both lenses looked good . This is not surprising, based on the simple theory that a) we're just looking at what used to be center half of the field and b) at small NA, the extra extension shouldn't introduce very much spherical aberration. 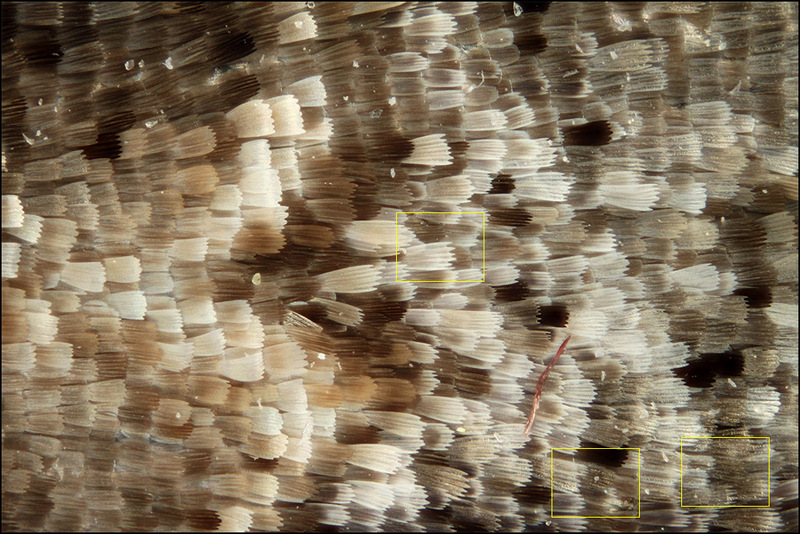 At 300 mm extension, giving roughly 20X magnification on-sensor, both lenses were still clearly resolving the fine striations on the scales, with minimal CA corner to corner. At shorter extension, the result was very surprising. In brief, the new Achromat looks hugely better than the old CF N Plan Achromat. What happens at 100 mm extension is that corners go severely astigmatic with the CF N Plan Achromat, while they hold up fine with the new Achromat. The astigmatism is so severe that the CF N Plan Achromat shows no trace of some low contrast details that can be seen clearly with the Achromat. Obviously this calls for some more images to be shot and collated. I have an Edmunds 10/0.25 (one of the cheap ones, not Nikon). It performs virtually as well as my Nikon Mplan 10/0.25. The biggest limitation is that it has about 1.5 mm of working distance. Roger Moore style raised eyebrow - you're using JPEGs? Would TIFFs not show you more? Nikon D700 would, perhaps the compression is more aggressive? Looks like the working distance is 5.6 mm. not ideal but workable for the stuff I do. Mark, the working distance is only 5.6 mm, but the lens shape is particularly easy to illuminate around. Large fine JPEGs, to be precise. The Canon T1i (500D) does not directly record TIFF, but of course I can create TIFF from RAW. 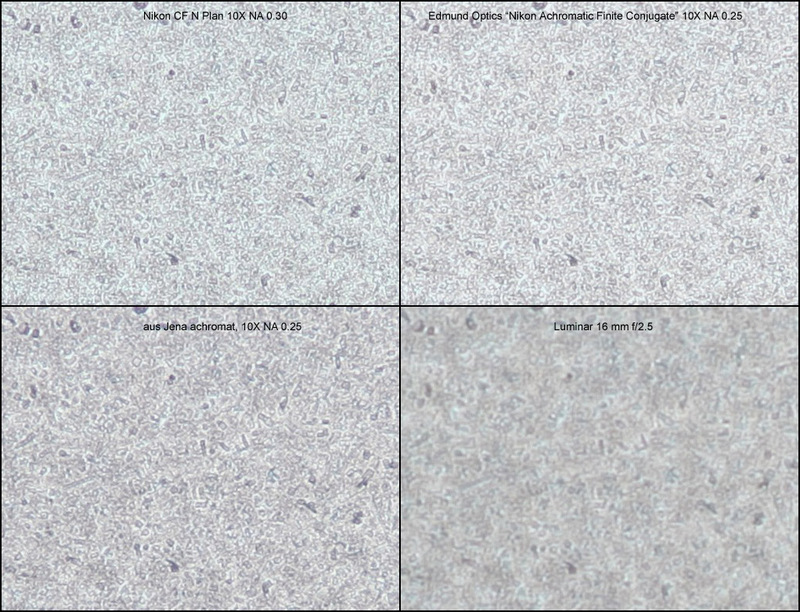 Here is the comparison of TIFF converted by Canon's Digital Photo Professional 3.6.0.0 using default parameters, versus a large fine JPEG recorded at the same time by the camera using picture style Standard. Actual pixels on the left, overview on the right. Shot at about 8 feet using an old 55 mm f/1.8 at f/5.6. 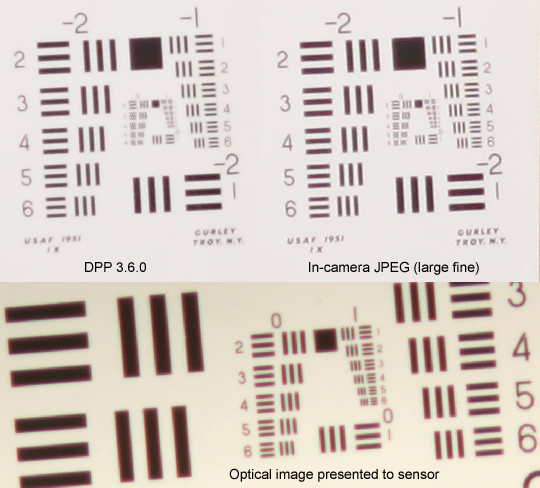 Accompanied by the optical image presented to the sensor (recorded in a separate exposure using a microscope objective to enlarge the aerial image), and presented here as PNG to preclude further concerns about JPEG compression for display purposes. To my eye, there is less than 1 set of bars difference, and that's in favor of the JPEG. 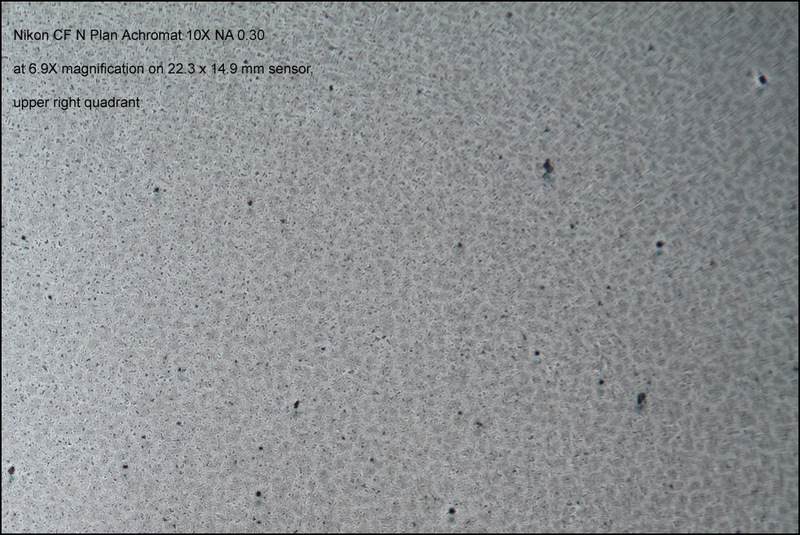 (Clearly there is lots more detail in the optical image than the sensor can capture. I have no idea what Nikons do. It would be interesting to see a similar comparison shot with your equipment. Here is the set of smoked-glass images that prompted me to say initially that I wasn't going to post out the results until I was sure they were correct. 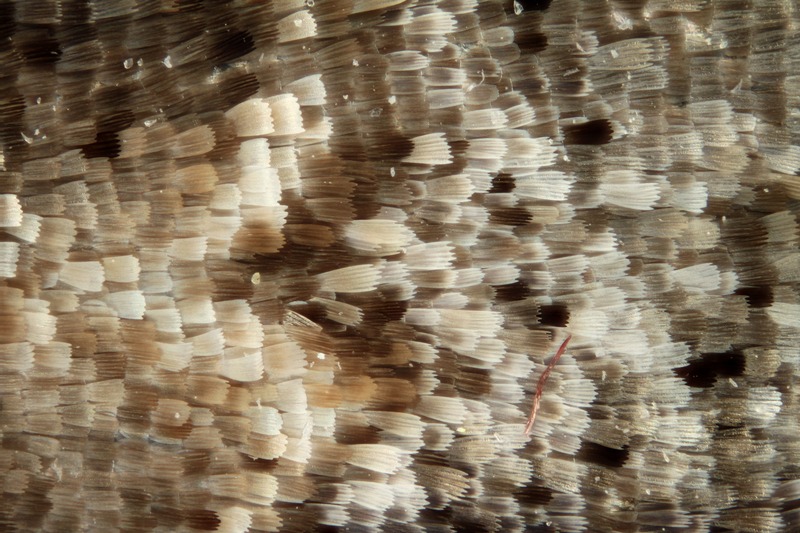 It's a microscope slide (2"x3" in this case) that has been held an inch or so above a match that was being lighted and producing its initial burst of black smoke. One match didn't give a very dark tone, so I did it again. 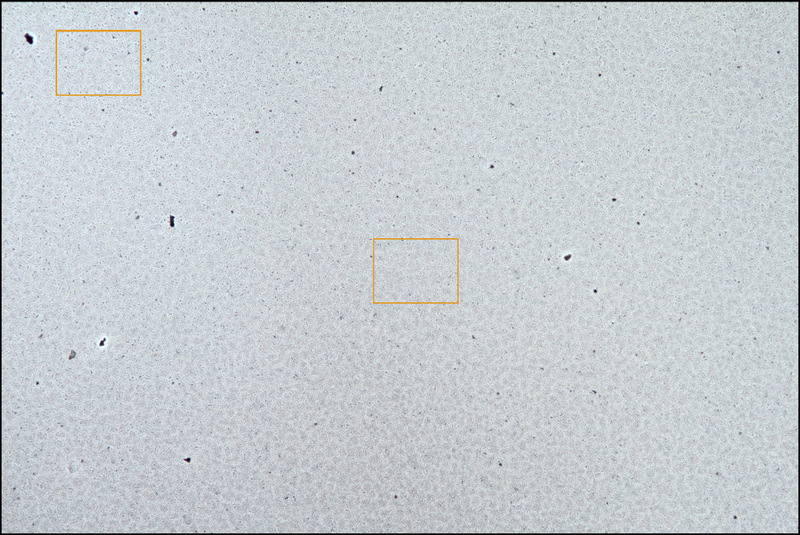 Here is a crop of one section, as seen by a 40X NA 0.65 160/0.17 objective (with cover glass taped to the objective so it doesn't touch the black film) and the Nikon CF N Plan Achromat 10X NA 0.30 160/0.17 (no cover glass). Here is a full frame of this crud, seen through the Nikon CF N Plan Achromat 10X NA 0.30, with locations marked where I'm going to show you some crops. And finally, the crops, 100% actual pixels. 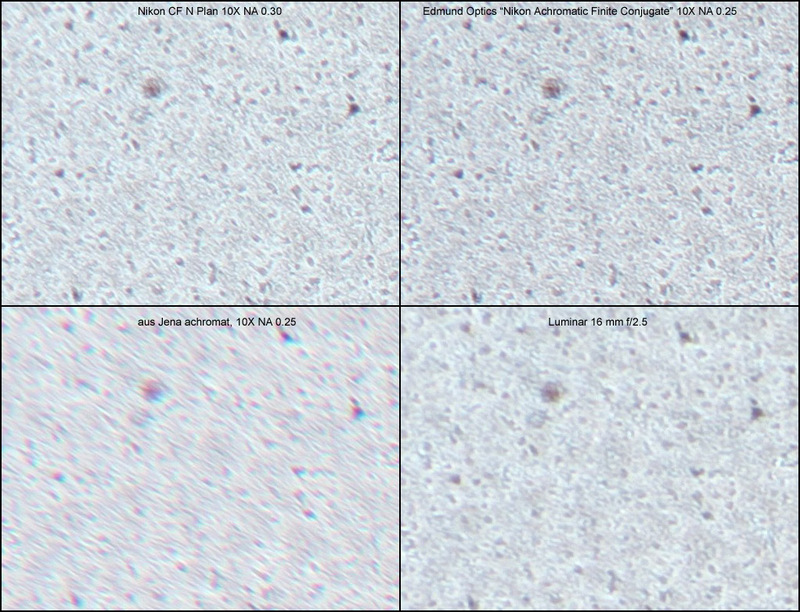 As I said, all of the NA 0.25 and 0.30 objectives blow away the Luminar at image center. At image corner, the advantage is less extreme but still present. What is shown above are all stacks at 2.5 micron spacing, but that doesn't seem to make any difference except to get everything in focus. Individual frames show the same pattern. One more thing... Since this is a nice flat subject, we can measure the total curvature of field for the new Achromat. 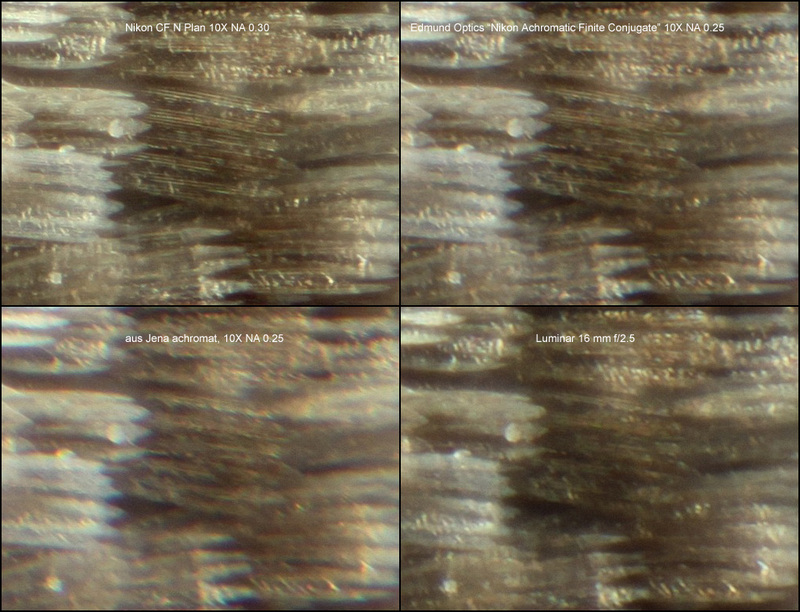 It turns out to be 40 microns, only 8 extra frames at a typical 5 micron spacing. At shorter extension, the result was very surprising. In brief, the new Achromat looks hugely better than the old CF N Plan Achromat. Thanks for testing this objective. 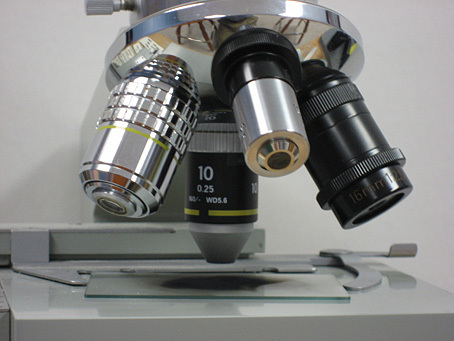 Do you perhaps know, or is it easy to test, the minimum magnification where the Edmund objective performs well? NikonUser once showed that a 4x objective performed very well at 7x or 8x, I wonder how the overlap of these objectives is. The JPEG shows finer lines : ! I like the test target. I fear there's no international standard on matches though, and the EU gnomes love to legislate over anything smelly but useful, so we might not have the same stuff in there. The coarseness of the particles might depend on the temperature of the condensing plate, too. Then there's the distance of the plate from the reaction. Perhaps we could use sandpaper as a standard target - I wonder if "160 grit" means the same thing and is available worldwide. Unlikely I suppose! Well, I was so intrigued by the unexpectedly good performance of this objective that I couldn't resist documenting a test. With no further ado, I present the upper right quadrant of the Edmund Optics Nikon Achromat at 6.9X, followed by the upper right quadrant of the CF N Plan Achromat in the same setup. These images confirm what I saw in a visual test earlier. The CF N Plan Achromat is IMHO useless under these conditions. The Achromat, on the other hand, is excellent. It exceeds my 15 Mpixel sensor resolution at image center, and holds up pretty well all the way to the corners. Color me clueless, but I certainly did not expect this behavior! Sadly, sandpaper is useless at this magnification. Try a piece and you'll see what I mean. The gritty stuff falling off would be a concern - Silicon Carbide would be safe I think. That goes to 1200 grit. 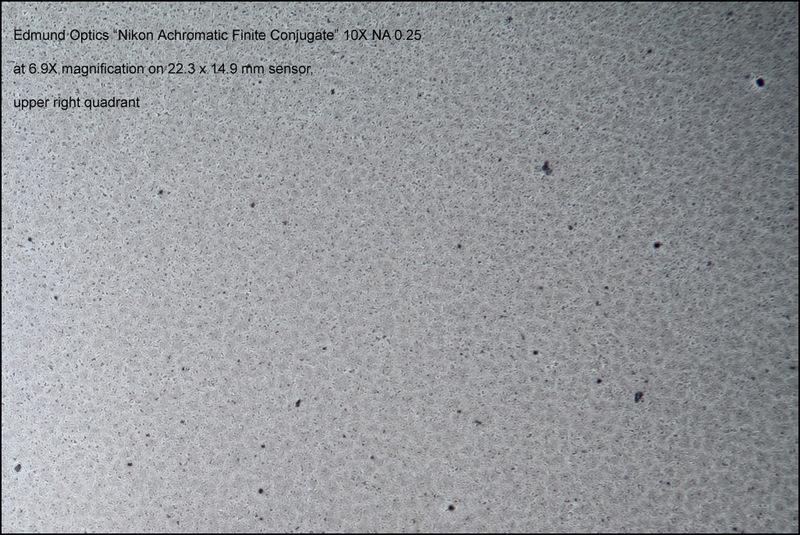 Work the sums to figure out how many pixels are covered by a grain of abrasive at 1200 grit. It's a surprisingly large number.